Bodene Thompson was born in New Zealand, and began playing rugby league in high school after his family moved to Australia. He made his début with the Titans in 2009, and last year he played for the New Zealand Maori team against England. His name is something of a mystery to me. It may be a variant of the Germanic surname Boden, taken from the Frisian for “messenger”. On the other hand, I have seen some people using Bodene as a form of the surname Beaudoin, a French form of Baldwin. It’s also hard not to wonder if it’s been chosen as a portmanteau of Beau and Dean – which make the obvious nicknames for this country-sounding name. Braith Anasta was born in Sydney, and is of Greek-Australian heritage (his surname was originally Anastasakis). He made his début in 2000, and first played for the Roosters in 2005. He is currently captain of his team. He is eligible to play for Greece internationally, but has done so only once, playing for Australia four times. He has played for New South Wales nine times, and for City six. He won the Dally M Rookie of the Year medal in 2001, the Jack Gibson Medal, and the Supporters Club Player of the Year in 2007, the Players Player of the Year in 2008, and last year won the Dally M Captain of the Year. Braith is a unisex Welsh name meaning “speckled”; however I’m not clear on the Welsh pronunciation. Braith pronounces his name BRAYTH. Braith can also come from the Gaelic word for “British” and the Old Norse for “broad”; both these words appear in various English surnames and place names, such as Braithwaite and Gilbraith, and these are exactly as Anasta’s name is said. Brief and brusque, this seems a name born to command, although it does sound a touch lispy. Bronx Goodwin was born in the country town of Parkes in New South Wales. He made his début in 2007, and joined the St George Illawarra Dragons last year. He played for the New Zealand Maori side in 2008. The Goodwin family are well known for their involvement in, and success at, rugby league over several generations in the Illawarra region. Bronx’s name is taken from the borough of New York City called The Bronx. It receives its name from the Bronx River, which was named for an early settler from Sweden called Jonas Bronck. His surname is a variant of Brink, from the Low German meaning “edge, slope, waterside grazing land”, and would have been given to someone who lived on the edge of a waterway (rather appropriate for a river). The Bronx is an area known for its cultural diversity, and has a tough image. The name Bronx is blunt and masculine and sounds very sturdy; it has the X at the end which has become such a name trend. Bronx was born many years before Pete Wentz and Ashlee Simpson named their son Bronx Mowgli, so the Goodwins were obviously ahead of their time. Constantine Mika is a New Zealander of Samoan descent. He didn’t have any luck at getting into the New Zealand first grade team, so moved to Australia and joined the Knights in 2009. The name Constantine is well known from history due to Constantine the Great, famously the first Roman Emperor to convert to Christianity. Although historians are divided as to just how “Christian” Constantine was, and whether he had a dramatic conversion or not, there is no doubt that his rule was a significant turning point in history. He also moved the capital of the empire from Rome to Byzantium, in the east; the city was renamed Constantinople in his honour (today it is known as Istanbul, in Turkey). Constantine is venerated as a saint in Eastern Orthodoxy and the Eastern rites of the Roman Catholic church. His name is from the Latin for “constant, steadfast”. This is a very rich and indeed, imperial-sounding name, redolent of Byzantine marble and gold. Constantine Mika uses the usual Con as the short form, but Stan would also work well. Drury Low is originally from New Zealand and grew up in Melbourne. He made his début in 2010 with the Canberra Raiders, and was also chosen for the Junior Kiwis (New Zealand’s second national team) the same year. His name is an English surname from an Old French word meaning “love, friendship”; by the 12th century it meant a love token or a sweetheart. Sir William Drury was an English statesman and soldier in the time of Elizabeth I, and his house in London gave its name to the famous street, Drury Lane. It has theatrical associations, for the name of the street is often used to refer to The Theatre Royal, which has been located in Drury Lane since the 17th century; it’s shown popular works from Shakespeare to Monty Python, and currently showcases West End musicals. You may also know this street as the home of The Muffin Man in the nursery rhyme, which was made familiar in the Shrek movies, but also makes an appearance in Jane Austen’s Persuasion. Drury is a small town near Auckland in New Zealand, but I don’t know whether this was the inspiration for Low’s name. Fuifui Moimoi was born in Tonga and grew up in New Zealand (pictured). 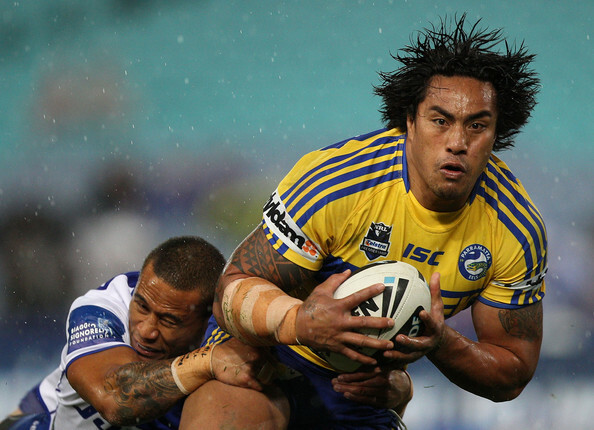 He made his début for Parramatta Eels in 2004, and has proved himself a valuable player. He is eligible to play rugby league for Tonga, Australia, New Zealand, the United States and Samoa, but so far has only played for Tonga and New Zealand. While watching a game recently, I heard the commentator explain that Fuifui’s name means “love love” in the Tongan language (as if to say, doubly loved). Not only is this a fantastic meaning for a name, but Fuifui Moimoi is without doubt the funnest name to say I have ever heard. Fuifui’s name is pronounced FOO-EE FOO-EE MOY MOY; you say it quickly and all the syllables have equal emphasis. It’s a name that you can’t help but smile as you say it. Fuifui goes by Fui in everyday life. Krisnan Inu was born in Auckland, New Zealand, to Samoan parents, and grew up in the western suburbs of Sydney. He made his debut in 2007, and began playing for the Warriors this season. He also plays for the New Zealand national team. A devout Mormon, he decided to forgo becoming a missionary, believing he can accomplish more for the church as a role model by remaining in the NRL. Krisnan is a variant of the Indian name Krishna, which means “black, dark, dark blue” in Sanskrit. Krishna is a central figure in Hinduism, believed to be the earthly manifestation of the supreme deity, Vishnu. He is said to have written the Hindu scriptures, the Bhagavad Gītā. Krisnan Inu calls himself Kris, and he has an interesting middle name too – Nevada! Sandor Earl was raised in the eastern suburbs of Sydney, and attended St Gregory’s College, a famous “nursery” for rugby league, where it is the dominant sport. Sandor made his début in 2009, and went to the Panthers last year, where he was named the club’s top rookie player. In 2010 he was part of the New Zealand Maori team which played against England, and is also reportedly eligible to play for Russia. Off the field, he works part-time as an underwear model. Sandor’s name is a Hungarian form of Alexander, and is pronounced SHAHN-dor. This is a form of the popular Alexander you don’t hear every day; it sounds like an exotic alternative to Xander to me. Shea Moylan just made his début for the Brisbane Broncos this season. Shea is an Anglicised form of the Irish name Seaghdha, said to mean “hawk-like” in Old Gaelic, with connotations of being brave and fierce, and is pronounced SHAY. Although Seaghdha is a masculine name, the Anglicised form must sound slightly feminine to some people, as it is listed as a unisex name. However, I have personally only ever seen this name on boys, with Australian parents usually opting to use feminised creations such as Shaylie or Shayla for girls. I have also witnessed a wide range of variant spellings, including Shae, Shay, Shaye, Sheye and Shai. Although this has been a reasonably well-known name here, I get the impression it’s not being used as much as it was. It’s an attractive name, pleasantly soft, and sounds enough like Shane and Sean to seem familiar to most people. Tariq Sims is from Gerringong, in the Illawarra area of New South Wales, and is of part-Fijian descent. He made his début with the North Queensland Cowboys this season; his brothers Ashton and Korbin also play rugby league. Tariq is an Arabic name translated as “he who knocks on the door”, related to the Arabic word for “nightcomer” (in the sense that someone who comes by night will need to knock on the door to wake you up). Tariq is also the name given to the Morning Star, because it comes at the end of the night, but this star (planet) is also used as a metaphor for a great man or chieftain. In the Qur’an, the Morning Star is used to refer to the Prophet Mohammad. Tariq ibn-Ziyad was a military leader who conquered Spain for the Moors; Gibralter is named after him, for it is the Spanish derivation of “mountain of Tariq”. Tariq Sims pronounces his name tuh-REEK. This name has a mysterious meaning with positive associations and interesting namesakes; it’s exotic, but not difficult to spell or say. The Sims were ahead of the curve with Ashton and Korbin – Tariq may be next to become popular. A very happy Father’s Day to all the dads! Here’s hoping you get spoiled rotten, and may your name suggestions always be taken seriously. Love these names, so original! Exactly the kind of creativity that comes to mind when I think of Australian names, though these are of course some extremes. This post reminded me of a statistic I read – last year in the Canadian province of British Columbia, there were 11 babies named Kesler born. Kesler as in Ryan Kesler, one of the top players on the Vancouver Canucks. Fans love him, obviously. There were also 9 Crosby’s born in BC last year, and Sidney Crosby scored the winning goal for Canada at the Olympic Games in Vancouver last year, but the name Crosby has other influences, too. Most of these names are from New Zealand and often from the South Pacific, such as Tonga and Samoa – I think they definitely have enriched our naming traditions a great deal. That’s fantastic about the hockey players – surnames can be very fertile too. Fuifui makles my day, I agree about his name being fun to say. There’s a french footballer named Toulalan, which is always great to here the commentators shout in the heat of the gamr. Bronx strikes me as a bit bizarre too, but it’s weirdly usable. It’s more “boy name” than Brooklyn, and unlike Brooklyn, it did actually start out as a person’s name, and has a better meaning than Brooklyn as well. It fits with several current naming trends, but now everyone would think you named your baby after Bronx Wentz. Constantine and Sandor have been long-standing loves of mine, so it’s fabulous to see them on Rugby players! I love Constantine as well; it seems like a hard name to pull off though in everyday life.